The gluteal muscles at the posterior of our bodies deserve to be honored for the amazing work they perform for us everyday-regardless of their outward appearance. Three different muscles make up the Gluteal group. In yoga, as in life, symmetry, equanimity, and the realization that the impact of our daily actions will reverberate throughout our being can motivate us to become more aware and conscious. In this case, let’s raise glute consciousness. This popular post provided you practices to stabilize the core and sacroiliac joints. The standing poses shared below will further your strength, stability and balance. Weakness in the gluteal group can lead to sacroiliac joint dysfunction, a common complaint in pregnancy. Another frequent result of tightness of this group of muscles is low back pain, and limitations in one’s yoga practice as well. Of course inordinate amounts of time in any activity: sitting at work, riding the bicycle, the horse, or even running, create imbalances through under or over use. The three muscles of the gluteal group are Gluteus Maximus, Medius, and Minimus. Their names reflect the size of the muscle, and somewhat indicate their location from superficial (maximus) to deep (minimus). The strong gluteus maximus is closest to the skin’s surface. It’s work is to extend the hip. For example, when taking Warrior I in yoga, it works with the hamstrings to extend the back leg. This muscle also externally rotates the hip, and helps to move the thigh away from the body (abduction). 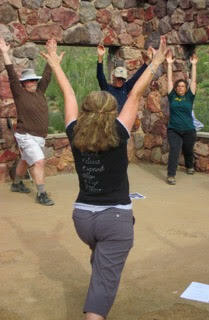 Warrior I pose activates the contraction of the gluteus maximus of the back leg. Now, we wouldn’t want to continue discussion of the gluteal group without acknowledgement of the padding and insulation in the buttock area. This padding and insulation is called adipose tissue, and by and large this tissue (otherwise known as um, fat) is necessary and a good thing, in moderation.So as we discover our glutes, you’ll also encounter your adipose…tissue. Stand with your feet hip width apart, take a giant step back as in a simple lunge or Warrior I with your hand on the buttock of the back leg. You should feel the gluteus maximus contract. The gluteus medius is located at the upper outer part of the hip. It is partially covered by the gluteus maximus muscle. The gluteus medius is crucial for stabilizing and equalizing the hips. 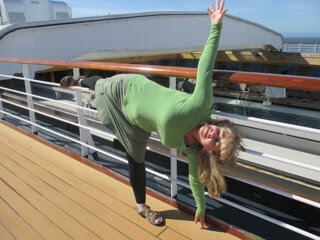 No need for a yoga mat to practice triangle with joy in Sitka Alaska. And awaken my gluteus medius after a bike ride! The classic side lying leg lift exercise helps to target and strengthen the gluteus medius. Your back leg in Triangle pose also addresses the strength of the gluteus medius. The gluteus minimus is situated beneath the gluteus medius. The minimus stabilizes our hips, rotates our thigh inward, and also abducts the hips. Gluteus minimus activation in half moon. Oh yeah, this is a cruise ship. Some of these actions are opposite of the gluteus maximus, but the gluteal group is so large that it can work in many different directions to keep the hips in harmony. 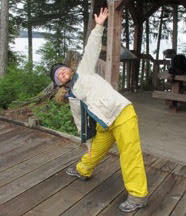 A version of this article originally appeared on YogaTuneUp.com.